My name is Hunny, pronounced Honey, (I think). I'm small, but feisty. If you don't believe me, just ask my best friend, Festas. I'll introduce him to you in a little while, but first I'd like to tell you how I met him. You see, I live with Mom and Dad and two brothers, whom I love very much. But every once in a while, they run away from home for a few days. I can always tell when they are going to do that because they start piling stuff into suitcases and backpacks. I try to look real cute to convince them to let me go too, but sometimes, no matter how cute I act, I can't go. It's sad but I get over it quickly because I get to go to grandma and grandpa's house, which is just down the street from my home. When I get lonesome I can almost see my house through the fences. I don't mind going over there because Grandma Timmie loves me and feels sorry for me. I can twist her around my little tail because she's such a softy. Grandpa Sam is too. They feed me and play with me, and there's Sasha and Zoë to hang around with over there too. It's almost like being home. So last weekend my whole family got the suitcases out and started running around like mad. You should have seen them. I couldn't go, hard as I tried. But here's the thing, I couldn't go to Grandma's house either because ... you guessed it, they were running away from home too. They were all going to Tahoe to a wedding, whatever that is. I heard so much about it, I thought I'd have to piddle on the kitchen floor. What was going to happen to me? Finally Mom explained to me that I was going to get to go bye-bye in the car. Oh boy! I love to go bye-bye in the car ... where's my leash, can we go now? can we go now? can we go now? I'm jumping up and down while she's telling me we're going bye-bye, so I almost miss her saying that we are going all the way to San Francisco. Now, that's a peculiar name. Wonder what they mean by that? Lots of people call Dad "Francisco", but don't try to confuse me, I just want to go bye-bye. We finally went bye-bye. When we stopped, we were at Uncle Larry and Aunt Michelle's house, and was I ever in for a surprise! That's when I met Festas. He was waiting for me in San Francisco! Wow! 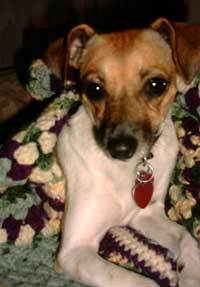 I'm what you might call sort of a Jack Russell terrier. Well, either mom or dad was a Jack Russell and my other parent was another kind of terrier, so I'm just a mixed up little terrier. But that's okay because I think BIG and I'm awfully cute. I weigh seven pounds after breakfast. 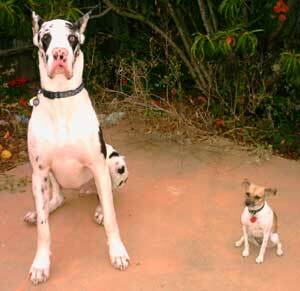 My friend Festas is a Great Dane and he weighs -- get this -- 170 pounds, before breakfast. I was a little scared of him at first because, well, he's -- how can I put this politely -- HE'S SO DARNED BIG! and he has a PINK NOSE! (What's that all about?) But Festas was awfully happy to see me and we played all weekend. He napped a lot. Guess I tired him out. You see, I can run really fast in the house and hop up in the air. I can run in tight circles and jump on the furniture too. That's fun, especially in somebody else's house. I tried to teach Festas my tricks, but he just couldn't do them like I do. So, I got to guard him while he took his naps. But he could run faster than me when we went for a walk. Even so, he was very nice about it. He'd wait for me until I caught up to him. Ah! When we went outside to -- ah, do our business -- I always gave Festas plenty of room, if you know what I mean. Wow! You should see what I saw. Well, that's another story. But finally I got to go back home, which made me very happy because my own bed is always the best. Everybody was glad to see me again, and I licked everybody hello, and then told them all about my new friend, Festas.